According to the study conducted by F. Luthans, R.M. Hodgetts and S. A. Rosenkrantz (1988), successful managers and effective managers seem to be spending their time on quite different activities. 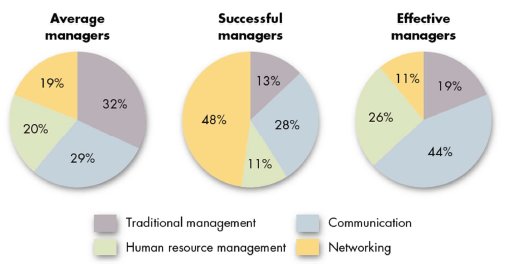 Their investigation on 450 managers revealed that successful managers spent 48% of their time Networking (socialising, politicking and interacting with outsiders), 28% on Communication (exchanging routine information and processing paperwork), 13% on Traditional Management (decision making, planning and controlling) and only 11% on Human Resource Management (motivating, disciplining, managing conflict, staffing and training). On the other hand, effective managers (those who do the best job), spends 44% of their time on Communication, 26% on Human Resource Management, 19% on Traditional Management, and only 11% on Networking. Notice that i’ve yet to spell out the definition for “successful” in the study. Successful managers in this case refers to managers who move up the quickest in an organisation. Personally i wouldn’t just define moving up quickest as being successful. Perhaps that’s because i’ve seen my fair share of managers who are being promoted to jobs that are too big for them, eventually creating a detrimental effect on the team or organisation. However, this study seem to suggest that if YOU want to move up the ladder, you ought to rethink how you spend your time. F. Luthans (1988, p.129) gave a more detailed breakdown of what “Networking” means. My conclusion from this study is different. I think the lesson here is not so much how do one get promoted quickly as a manager, but for leaders to reconsider their decision making process and criteria in promoting others. If you as a leader think you have been promoting effective high-performers, think again. Because you may have simply been promoting good “networkers”, managers who spend a huge amount of time “socialising/politicking and interacting with outsiders”. Are these who you really want to be leading your people? Do you see this happening in your organisation? Luthans, Fred. “Successful vs. effective real managers.” The Academy of management EXECUTIVE 2.2 (1988): 127-132. Luthans, Fred, Richard M. Hodgetts, and Stuart A. Rosenkrantz. Real managers. Cambridge, MA: Ballinger, 1988. Thanks for sharing. The “Peter Principle” is new to me. I’ll go check it out.